WFLYDM0023: No mgmt-users.properties files found. I hope someone can lend me a hand. thanks in advance. 1. Re: WFLYDM0023: No mgmt-users.properties files found. Not a big deal, but the screenshot shows that you are using wildfly 13, and not 11. When you try execute that script, it tries to load existing user files, named application-users.properties or mgmt-users.properties. If you haven't modified the directory structure, these are found in %WILDFLY_HOME%\standalone\configuration and %WILDFLY_HOME%\domain\configuration. If those files don't exist, or the directory structure is different, the script bombs out. If you did modify the directory structure for whatever reason, you can modify the add-user.bat script to point to wherever your configuration directories are. 2. Re: WFLYDM0023: No mgmt-users.properties files found. thanks for your reply and observation Greg, I apologize ,but only change enviroment variables and it´s running, I dont know why? If I have installed jboss 5.1.0GA and wildfly 11, thanks Greg, sorry my english is poor. 3. Re: WFLYDM0023: No mgmt-users.properties files found. If you had JBoss AS 5.1 on your machine already, you probably had an environment variable named "JBOSS_HOME", and it may have pointed to your 5.1 location. If so, the add-user process was probably looking at your 5.1 directory, and couldn't find the file. 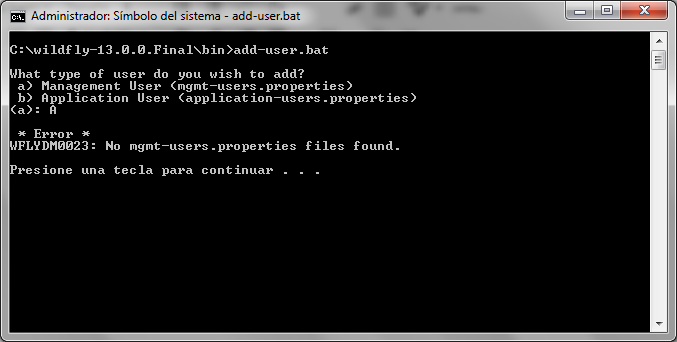 The directory structures between AS 5.1 and wildfly are completely different. If that is what happened, then it's a good thing that the file wasn't found. Otherwise, you would be adding a user to your 5.1 environment, and then wonder why the user wasn't working when running wildfly. 4. Re: WFLYDM0023: No mgmt-users.properties files found. Yes, I did it, thanks my friend.